This weeks tip is one of those small tips. Something that I do a little bit differently than many people. It's neither right, nor wrong, just a preference. 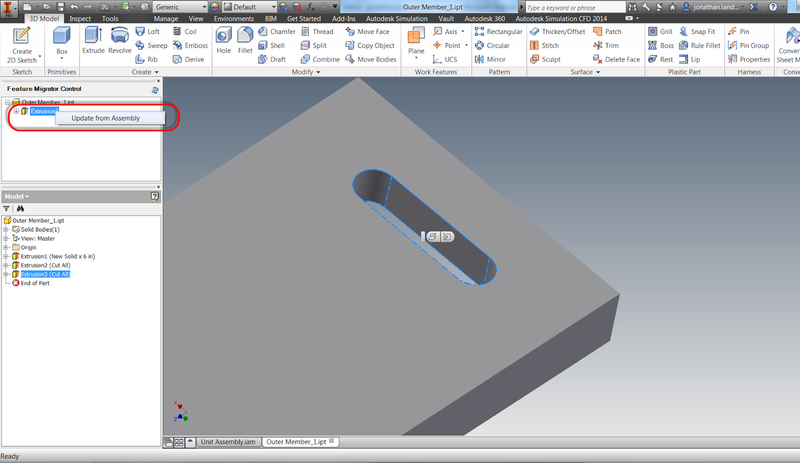 It's how I create an angled workplane on a cylinder. For example. Here I have a barrel for a paintball gun. 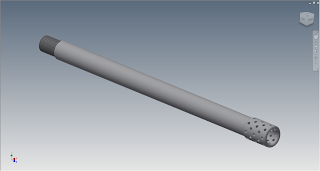 It has several vents in the barrel, and some of them are rotated in such a way that they don't align with any of the origin planes. 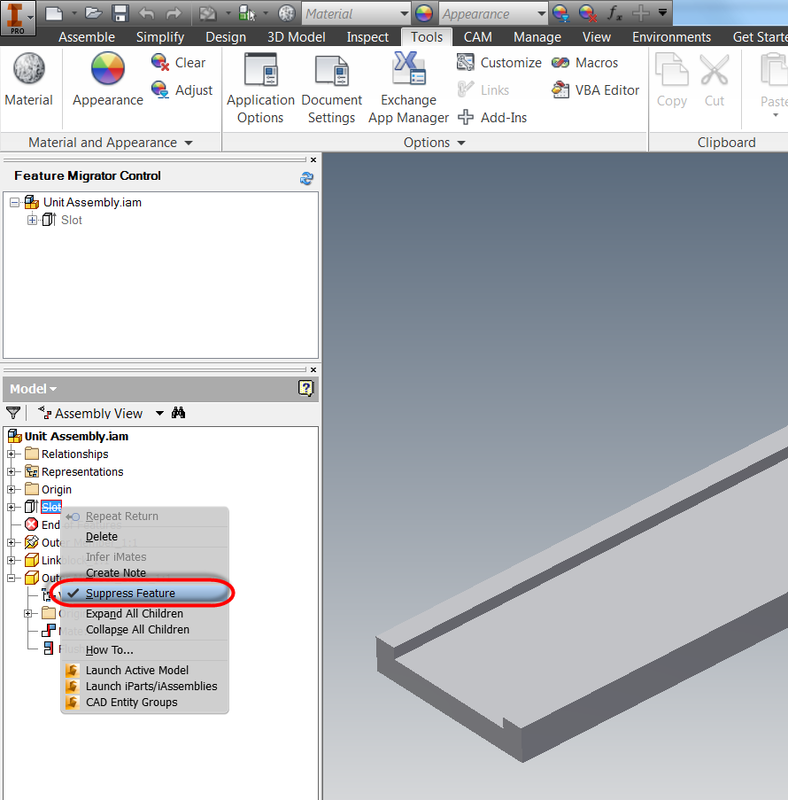 1) Create an angled workplane on an origin axis, using an origin plane for orientation. 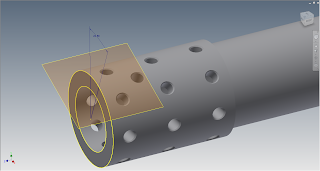 2) Create a second workplane, parallel to the first, and tangent to the cylinder's surface. There's nothing wrong with this method. It works great, and if you're a user that's happy with it, carry on! But I like to create this workplane a little differently. First, I create a sketch perpendicular to the plane I intend to place. Next, I draw two lines. One I use for a datum, the second I use to set the angle that I want my plane to sit at. 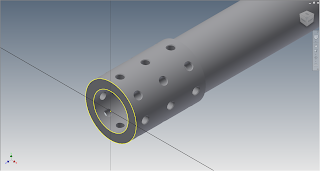 I make sure the end of the line is coincident to the cylinder I want to create the plane on. I then finish the sketch. 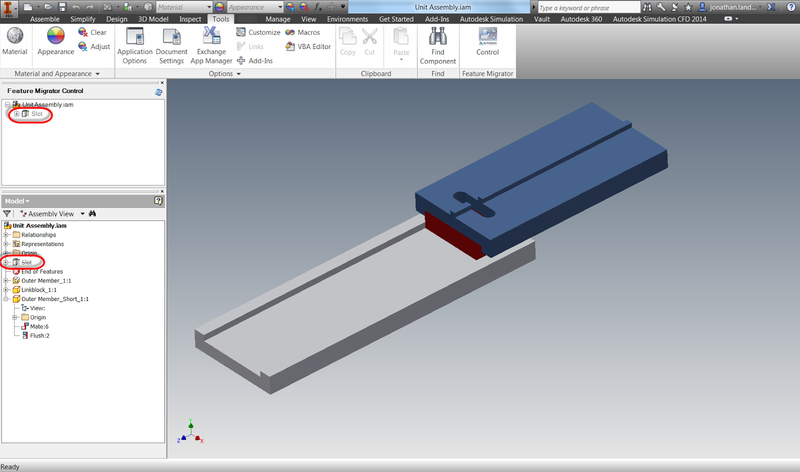 Next, I start my workplane tool, and using the Normal to Axis through Point option, I pick the end point of the line, and then the length of the line. With this done, I have a workplane that is tangent to the cylinder and at the angle I need, albeit by a different approach. Now all I have to do is create my hole the same way as usual, and I'm off and running. 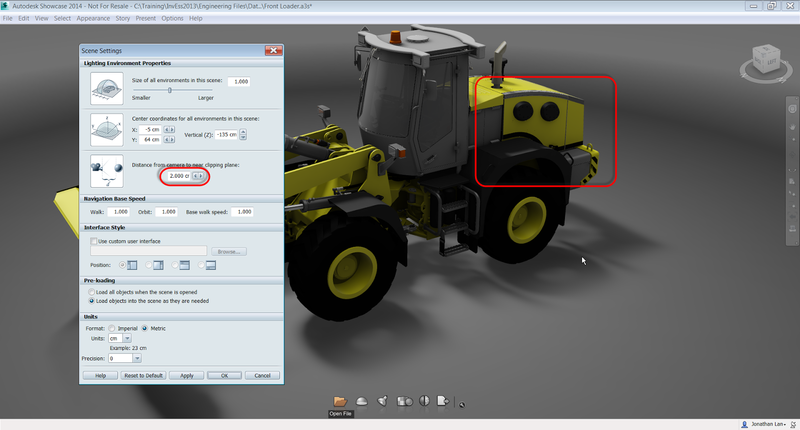 Finally, I can right click the sketch and workplanes, and uncheck Visibility to hide it! Finally, a few patterns and fillets, and I'm all done! Why do I choose this method? I just like it. I feel like it's simpler, and faster to create this type of planes this way. No other reason! And at long last, I've had a chance to create a video to go with my blog post! Check it out below! So take a look at this method and see if you like it! And feel free to drop a comment! 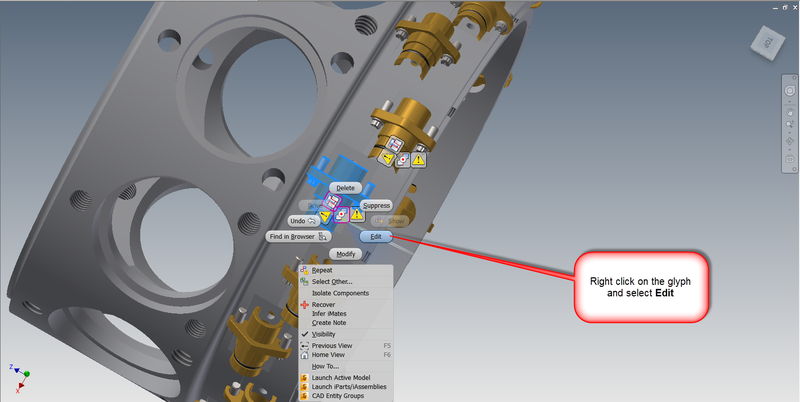 In my last post, I talked about a utility I found on the Autodesk Exchange Apps website for migrating assembly level features to parts. 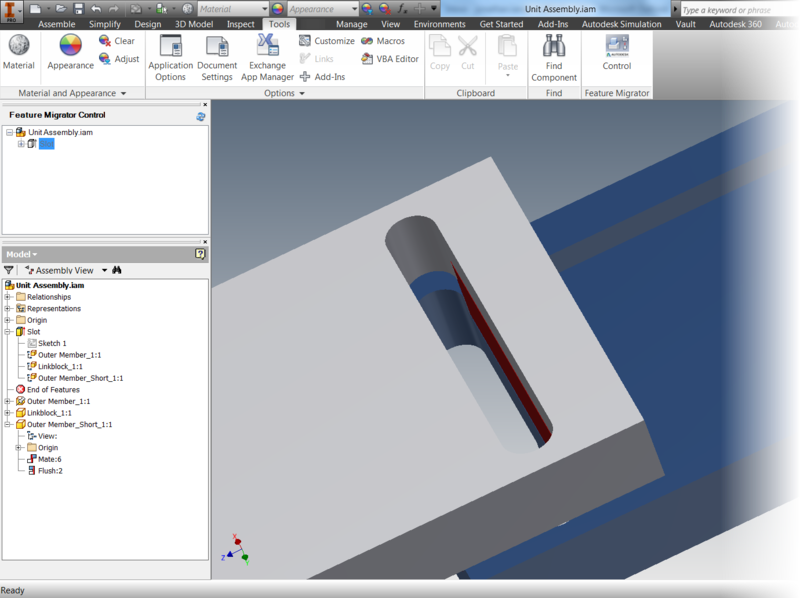 I like the little app, and I've decided it's got a home with my Autodesk Inventor installation for the foreseeable future. While on a business trip the early part of this week, I was messing around on my laptop and found another feature I like about this app. 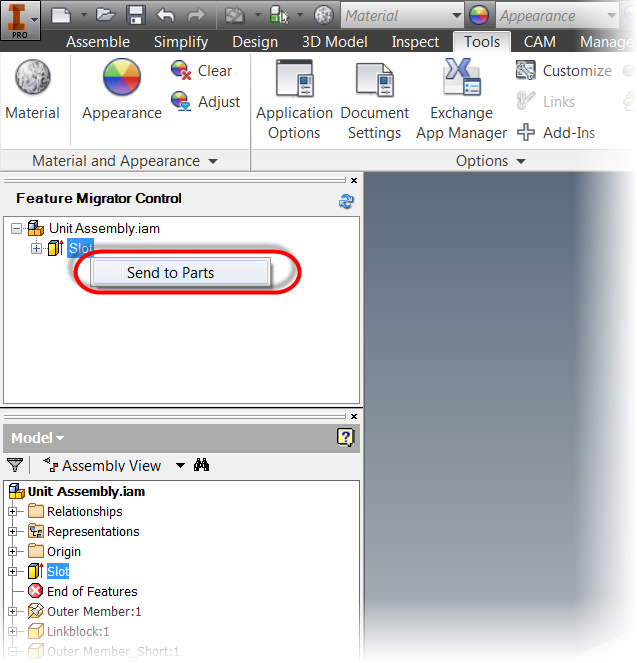 The ability to update the migrated part features from the assembly! 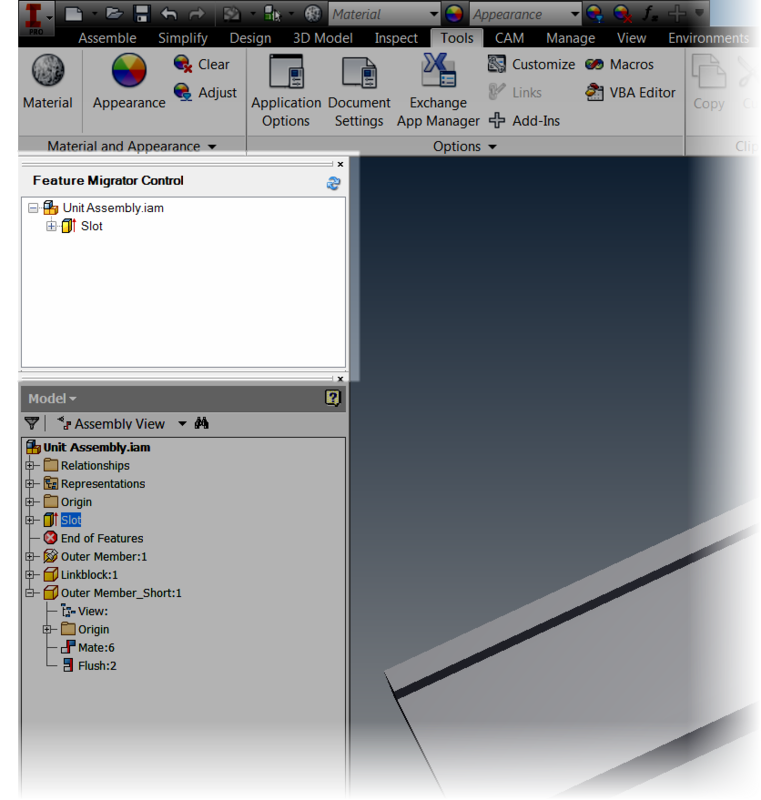 First, I'm going to open my Feature Migrator by clicking the icon on the Tools ribbon. This can actually be done at any point in the process, but I'm going to get it out of the way! 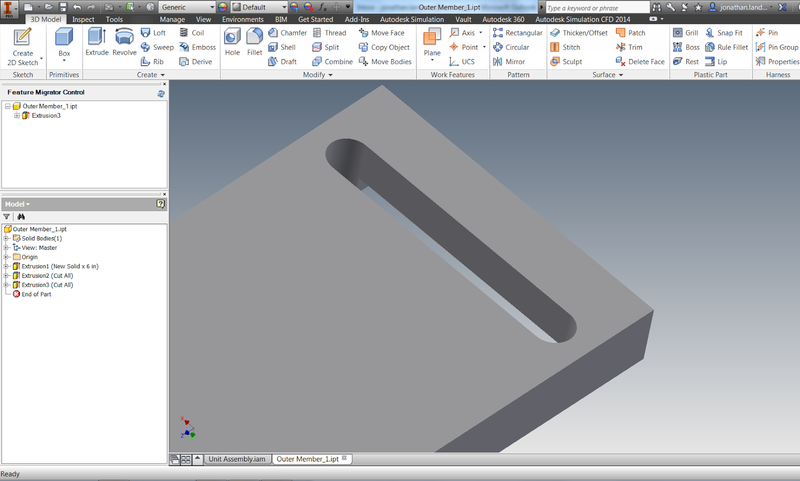 Taking a look at the files I used my previous post, the slot migrated from the assembly to the parts is seen. 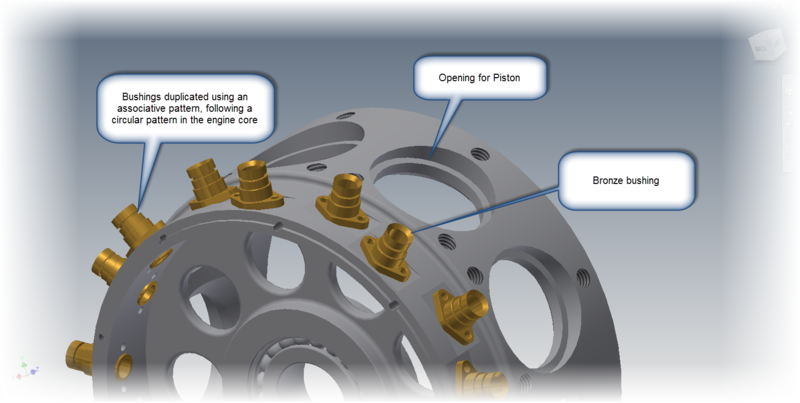 The assembly feature is currently suppressed, which was done by the migrator when it first created the part features from the assembly feature. But now, I'm going to update the assembly level feature, and use it to change the part feature it created. 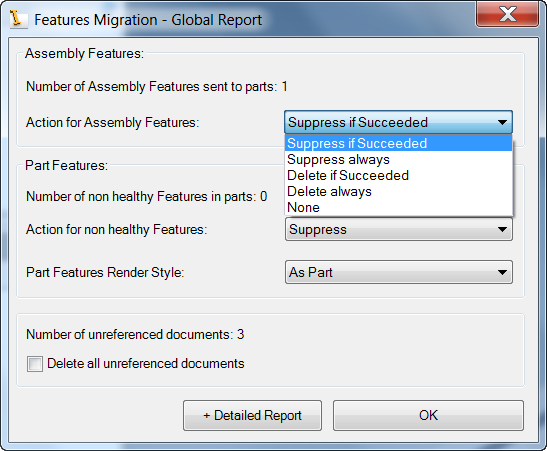 First, I need to unsuppress the assembly feature by right clicking on it, and unchecking Suppress. Now, I can edit the assembly feature just like I always have. 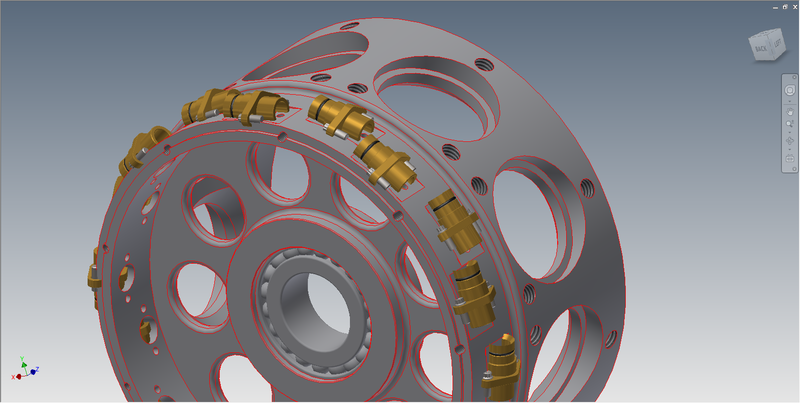 Once the feature is edited, I can now Open the parts that are affected by the feature. 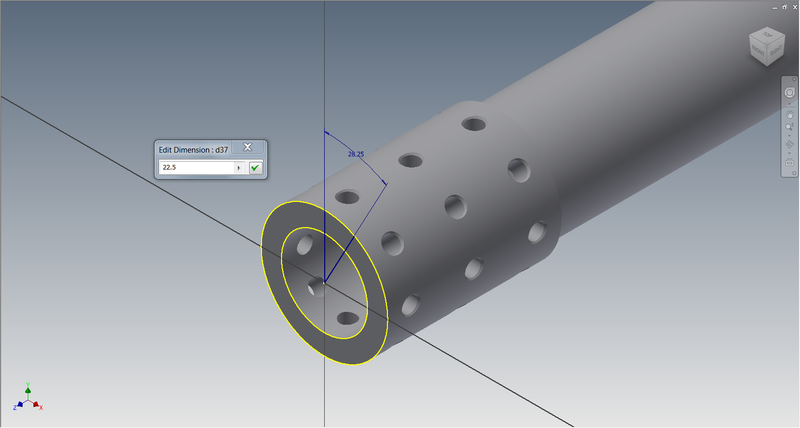 Note that it's important I open the part in a separate window, don't edit the component in place. 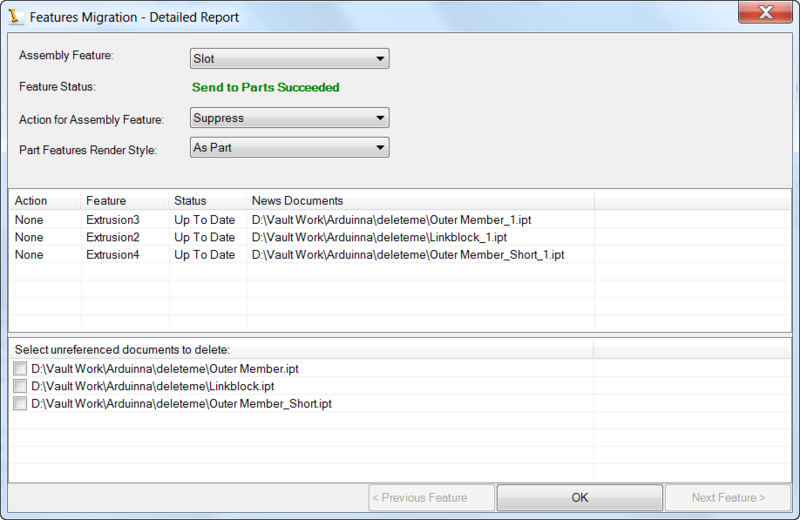 With a component open, the Feature Migrator will show the feature created in the part by the assembly feature. Right clicking on this feature will show Update from Assembly. 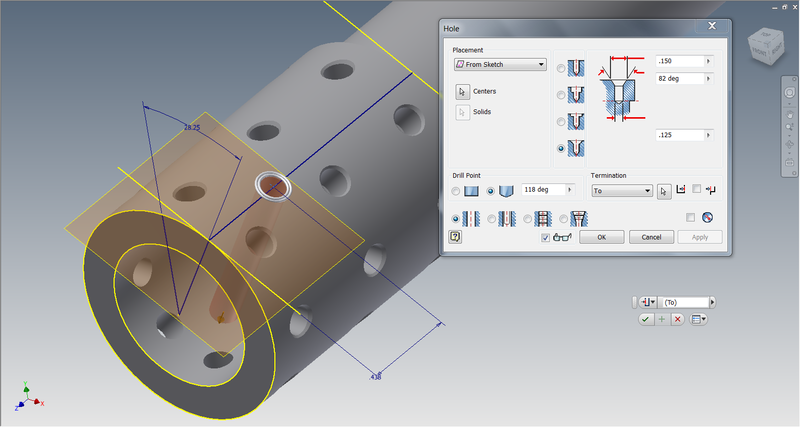 Choosing this option will update the part feature from the assembly feature that created it. 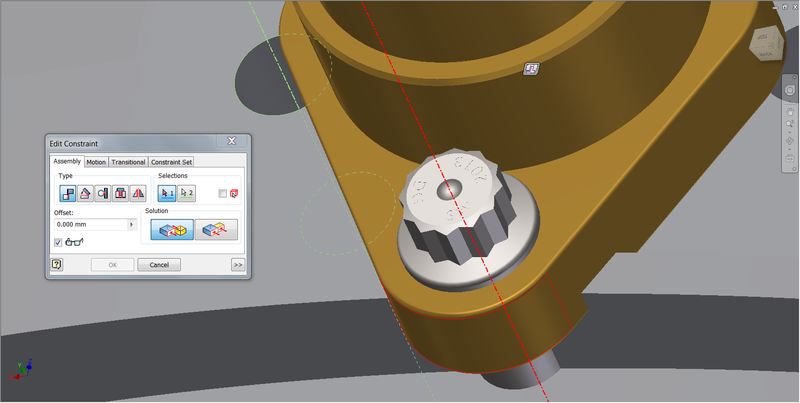 Repeating this step for the other parts updates the other parts that use this assembly feature, and all is done. In summary, I do like this feature in this app. I think it opens up more possibilities of what can the tool can be used for. 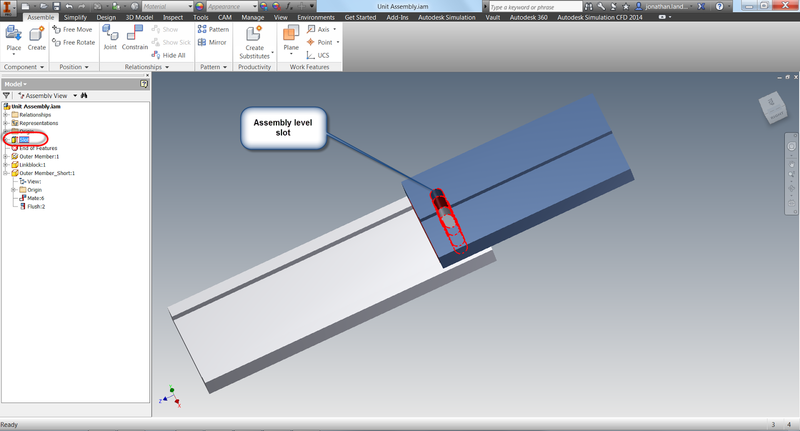 Especially when a feature needs to be cut at the part level, but it's easier to position it at the assembly level. If you can't tell, I like this app. But why don't you take a look at it and see what it can do for you! You can't beat the price (free)! I hope it doesn't become too much of a habit. But travels have again taken me away from my video gear, so I'm not able to provide a video again this week. But below is a post sans video. Fingers crossed I can add one soon! 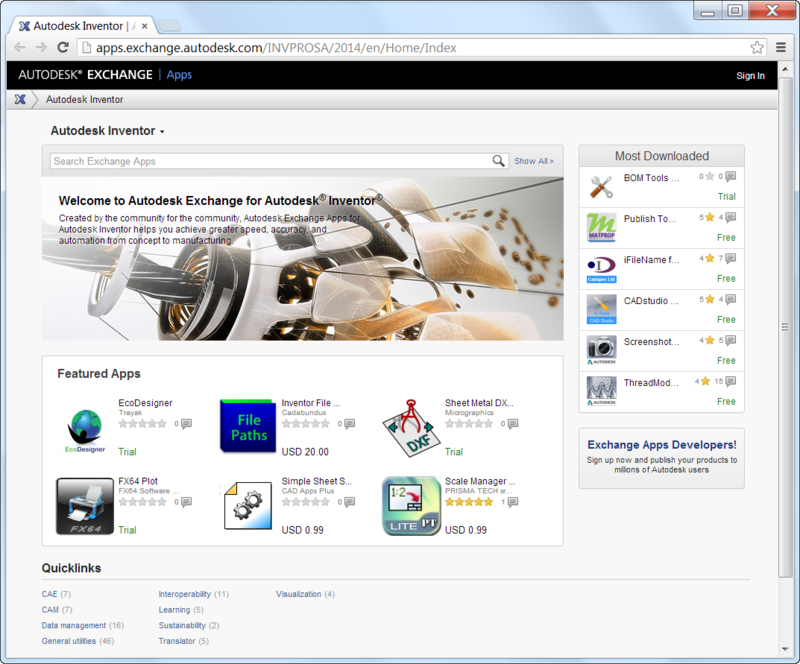 The Autodesk Exchange Apps website is an Autodesk Inventor tool that I think doesn't get the press it deserves. 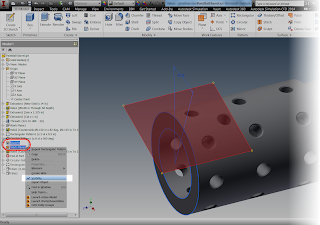 Much like the application stores most of us have used for our mobile devices, the Autodesk version has utilities for many Autodesk programs, such as AutoCAD, Autodesk Inventor, and Autodesk Vault. The reason I've decided to talk about this site is that I found a nice little utility I liked, one that I'll definitely be saving for the future. It's called "Inventor FeatureMigrator", and it's what it does that makes it interesting. 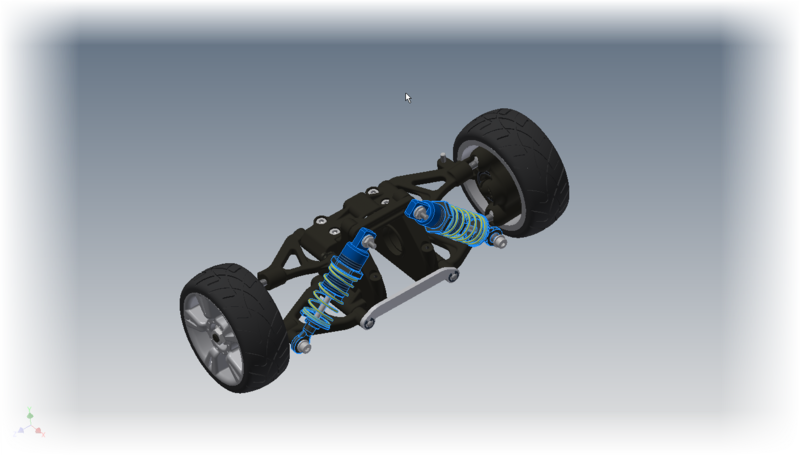 It can take an assembly level feature, and transfer it down to a the parts that the assembly level feature passes through. I've been asked if there's a way to do this many times, and the answer has always been "no". Now, with this little free utility, it's not! The first thing I did was download it from the site, and install it by clicking on the downloaded file. Once the app is installed, I'm ready to use it. 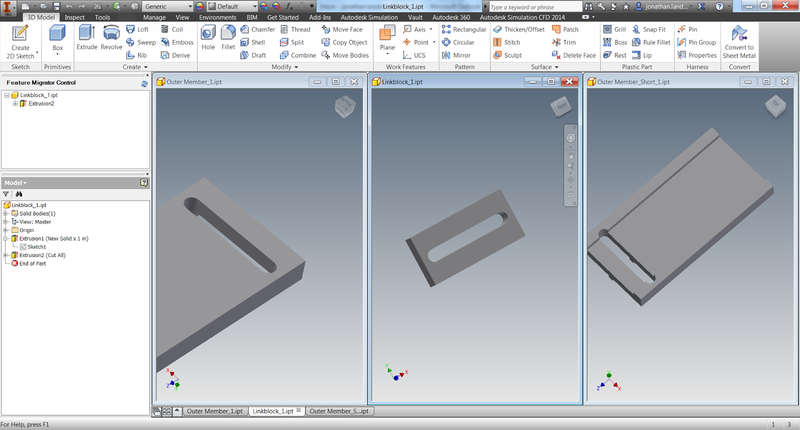 Here, I'm using an assembly of three components, with a slot placed through all three of them using an assembly level feature. 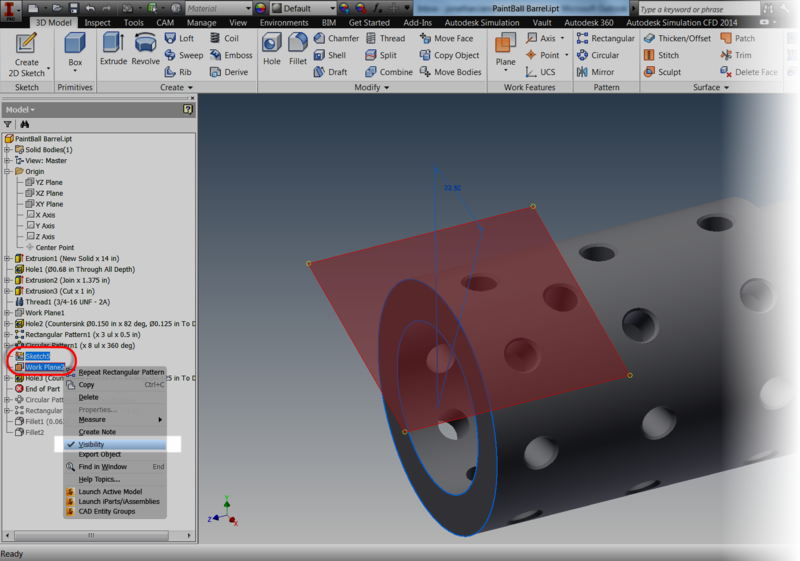 At the moment, Inventor looks much like it always has. 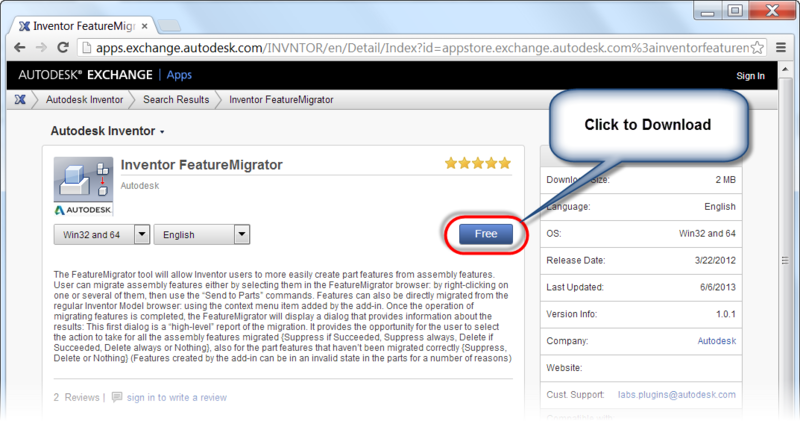 But, once installed, Inventor FeatureMigrator adds a button to the Tool Ribbon in the assembly file. Clicking on this button starts the tool, which appears as a browser style window inside Inventor. Here I can see the assembly level features that are applied to this model, in this case, it's just a single feature I've named "Slot". 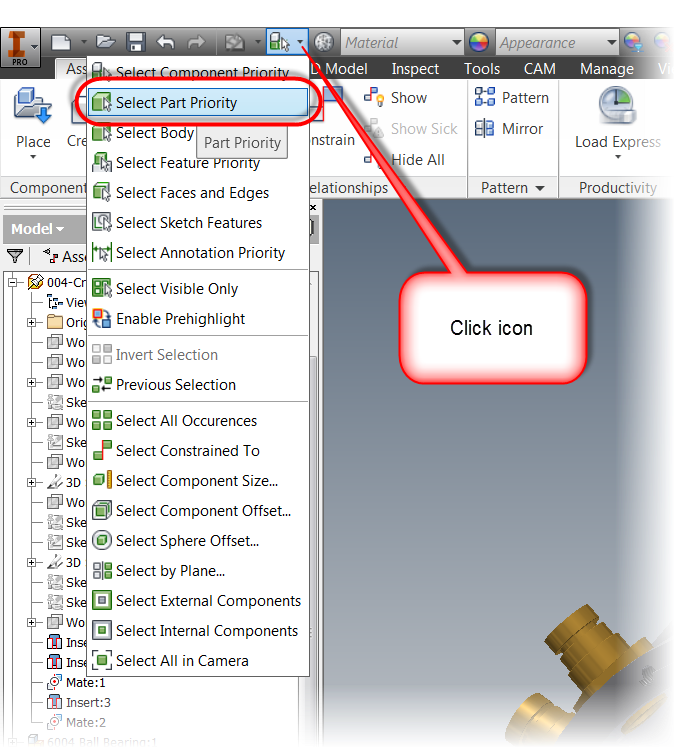 To start the process, I right click on the feature I want, and choose "Send to Parts". 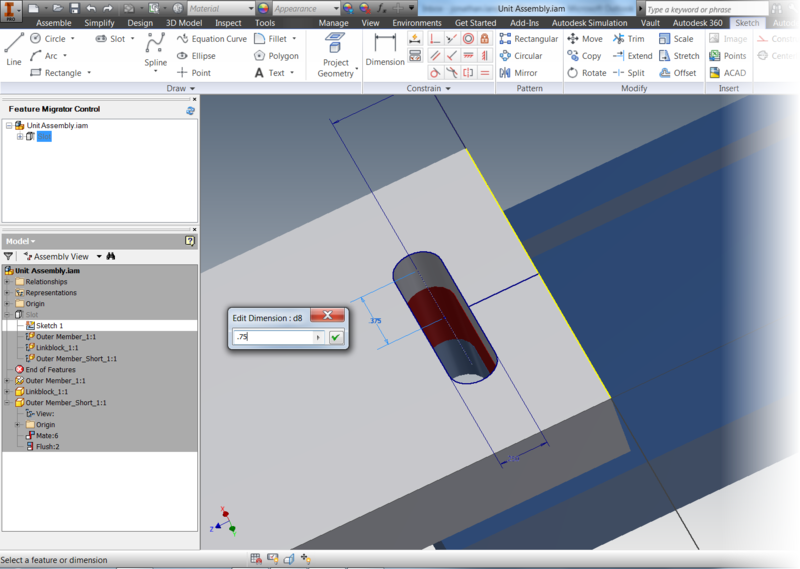 A dialog box will appear that has options for what to do with the translated assembly level features, such as options for suppression or deletion. 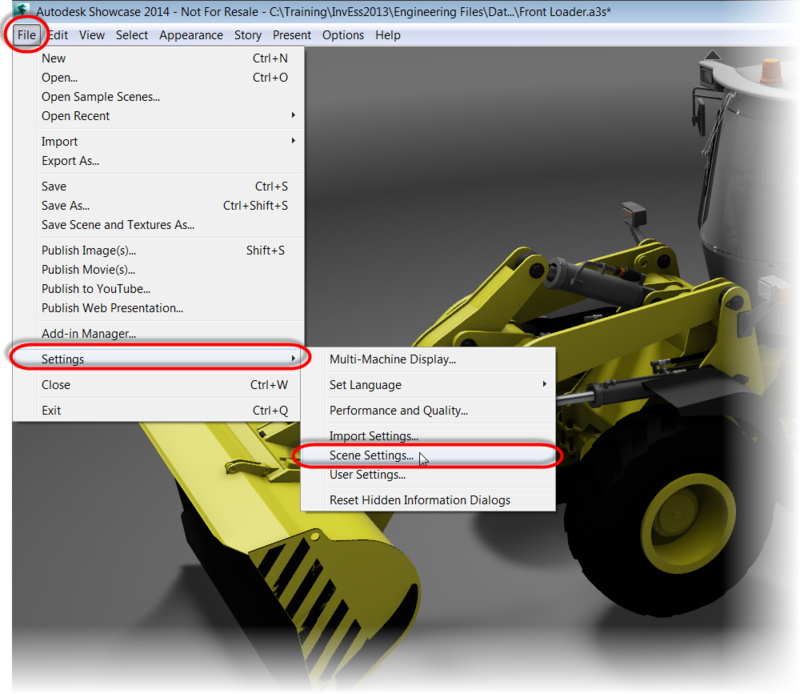 There are also options for how to handle "non-healthy" part features, even what render style to use on the part features. I can also click on the "Detailed Report" button to see more info on the translation. Hitting OK will complete the process. 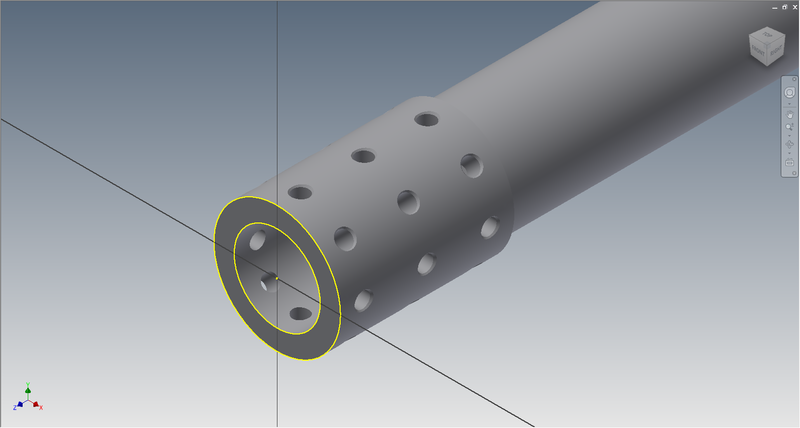 The Slot I created at the assembly level is now pushed down to the part level. To confirm this, each part can be opened and checked. There are a couple of interesting quirks, in this little utility. They don't bother me, but it wouldn't be right for me not to mention them. 1) It creates new copies of the components it affects, adding a "_1" to the filename. 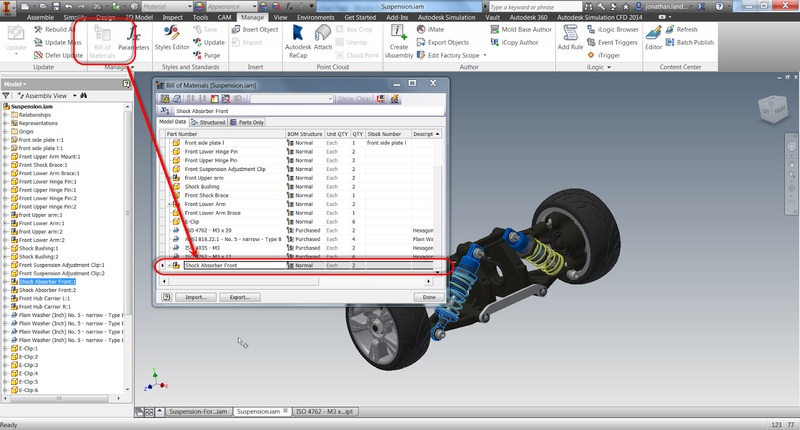 I presume this is to make sure that sweeping modifications when a part use across multiple assemblies is modified. 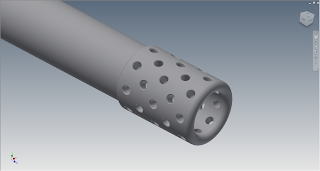 2) The sketches it creates aren't fully constrained to the new geometry. 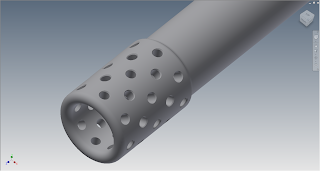 So it may be beneficial to constrain (or fix), the geometry in each part. For me, these are things are just curiosities for the advantages I gain, but I leave it for each user to decided. 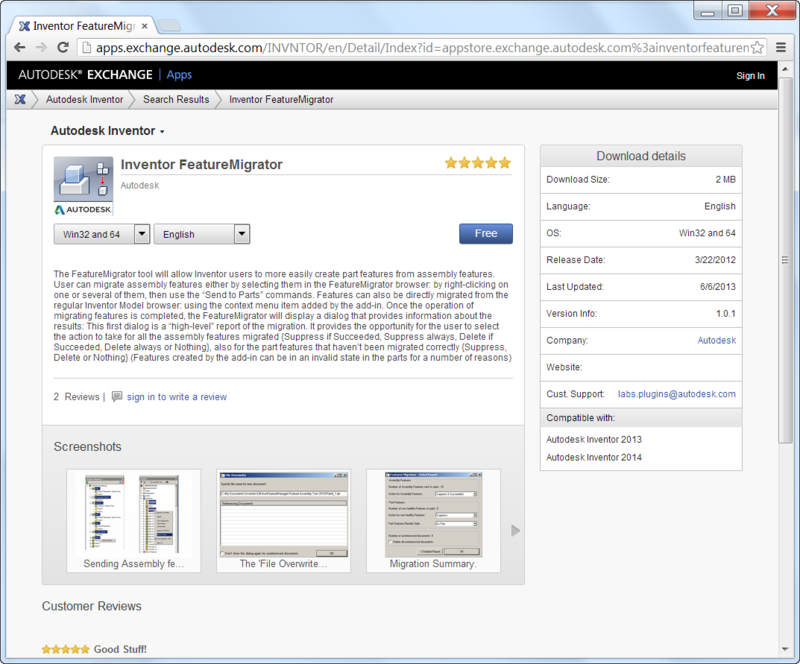 If you think this tool is useful, Swing by the Autodesk Exchange App website and take a look! I also like the Feature Recognition and Thread Modeler apps, so feel free to take a look at those too! Once again a busy travel week has made my life hectic enough that I'm not able to create the video that typically goes with most of my posts. But with another busy week ahead, I've decided to press forward and create a text only post to describe a new feature that I've had a chance to use to great effect in Autodesk Inventor 2014. That feature is Show Sick Constraints. 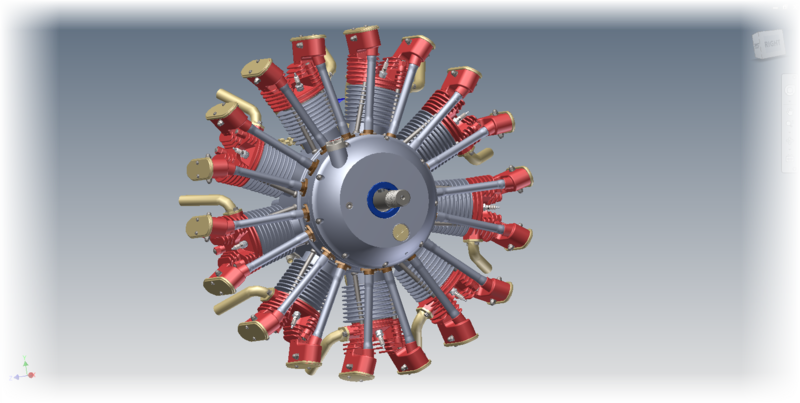 As some may know, I've been slowly trying to rebuild a 9 cylinder radial engine in Inventor. 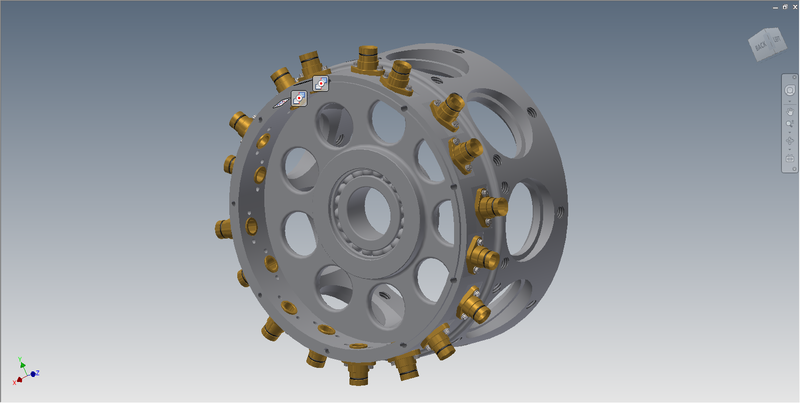 I found the original model on GrabCAD in Solidworks and several neutral projects, and decided to take it on with a long term goal to rebuild it completely in Inventor. I work on it here and there, so I suppose it's going to take a long time to finish it! One challenge I encountered was a simple one. I was assembling bronze bushings into the engine core, there were two per cylinder, and 9 cylinders total. So an Associative pattern readily took care of this. However at this moment I realized my mistake. 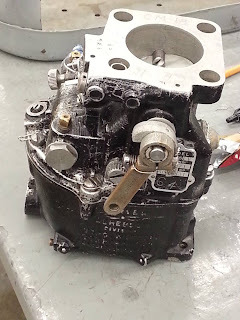 I had meant to put in a subassembly containing the bushing, and the bolts. However, in my haste, I had only put in the bronze bushing as a part. This was easy enough to fix. All I had to do was to switch my selection filter to Select Part Priority. 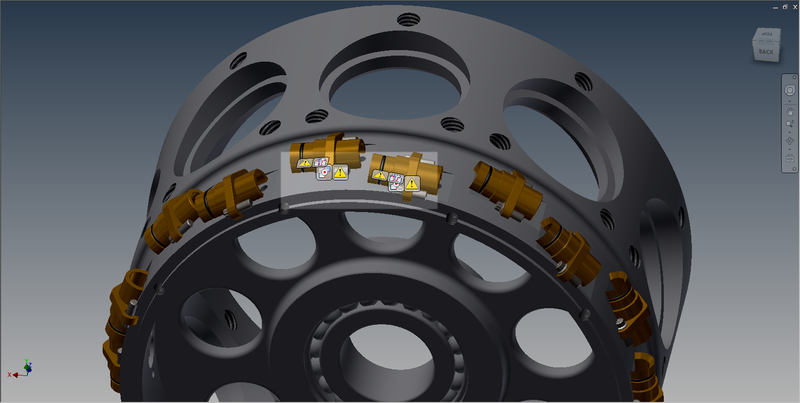 Then I selected one of the bushings, and use Replace All Components to switch to the assembly I had intended to put in. 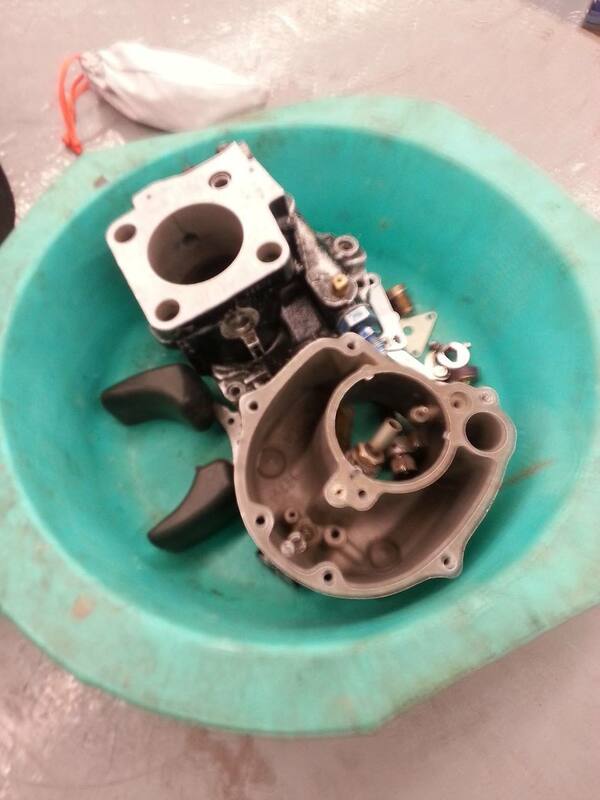 Replace All Components will let me change out all the bushings. It let's me browse out and get the assembly I had intended to place, but now I have a problem. 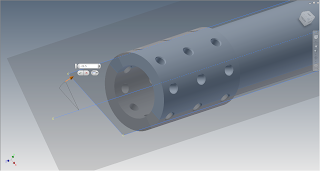 The constraints have broken, and I have to fix them. There's four, two for each bushing I had placed. The other sixteen aren't a problem, once I fix the originals, they'll fix themselves. 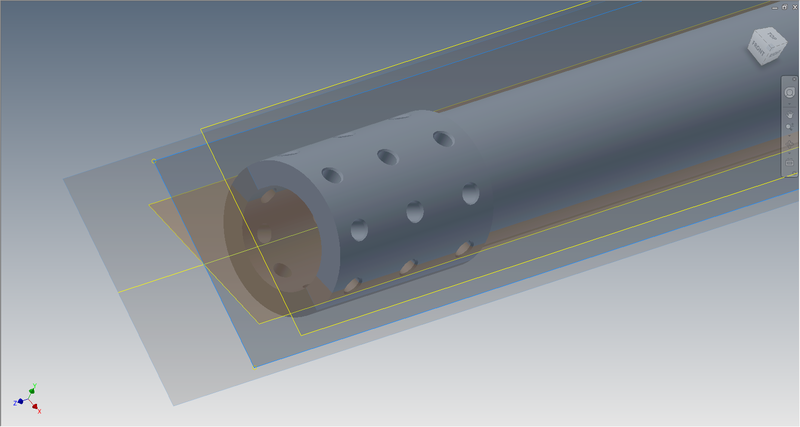 The bushings are rotated sideways because the constraints are "sick" and need to be fixed. 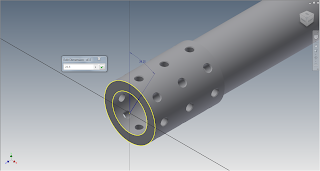 Fortunately, Inventor 2014 has a new function called Show Sick Constraints. By clicking this icon, the sick constraints are graphically shown as glyphs on my screen. I don't have to fish through the browser to find which they are and address them. Now I can select one of the glyphs, right click, and choose Edit. The screen capture is a little busy, but right click on the icon. The Edit icon brings up the Constraint Edit screen. Now I can re-associate the constraint that broke on me. Note that in the screen shot below, I've already fixed one bushing. 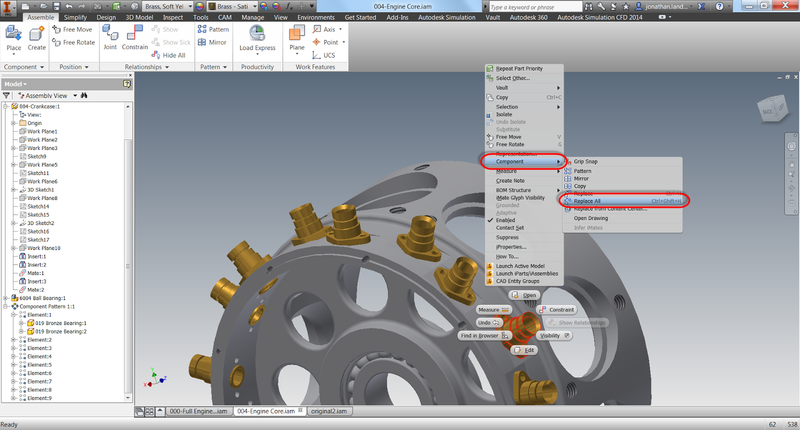 I just click the icon, and select the geometry I want the constraint to act on. Once all the constraints are fixed, I can now see that the rest of my pattern has reoriented itself too. The constraints, now repaired, still show their glyphs on the screen. Now I can use the Hide All Constraints" icon to remove the glyphs. After clicking the Hide All Constraints icon removes all the glyphs on the screen, and now I'm back in business! 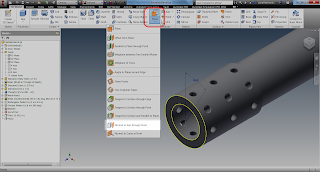 If you have Inventor 2014, or you're thinking of going to it. Take a look at this feature! It's well worth it! For other new features with Assembly Constraints in Inventor 2014. Check out my previous post on Constraint Relationships. I have to thank Dave Goetsch for sharing this file on GrabCAD, Without his work, I wouldn't have been able to write this post. Check out his excellent work on this and other projects. Note: The assembly I was working on today isn't one I'm free to share, so I'm using a "stunt assembly" as a stand in. Bear with me! I'm still out here working far from home in Minnesota, where I'll be the rest of this week. And while I don't have time to create any big posts, I can post a quick tip for today. One I used just today. 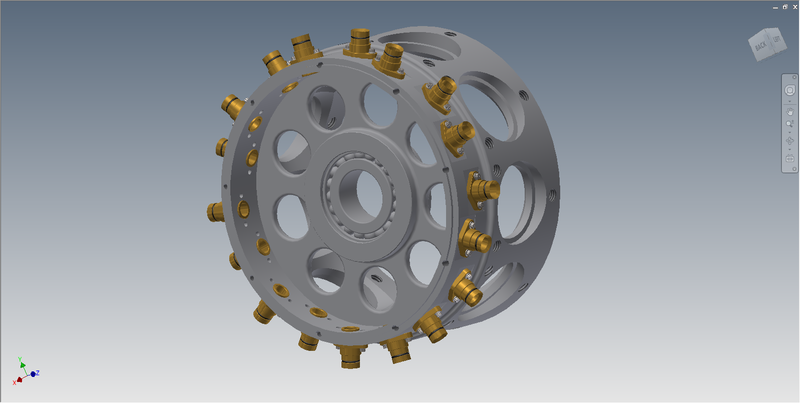 I was working on an assembly that had several components that were very similar. They looked so close that they may have been a second copy of the same component, or a different component entirely. To make it even more interesting, there were several components that were similar, so it wasn't even an either or, it was one of many. So how can I quickly determine which components belonged where? 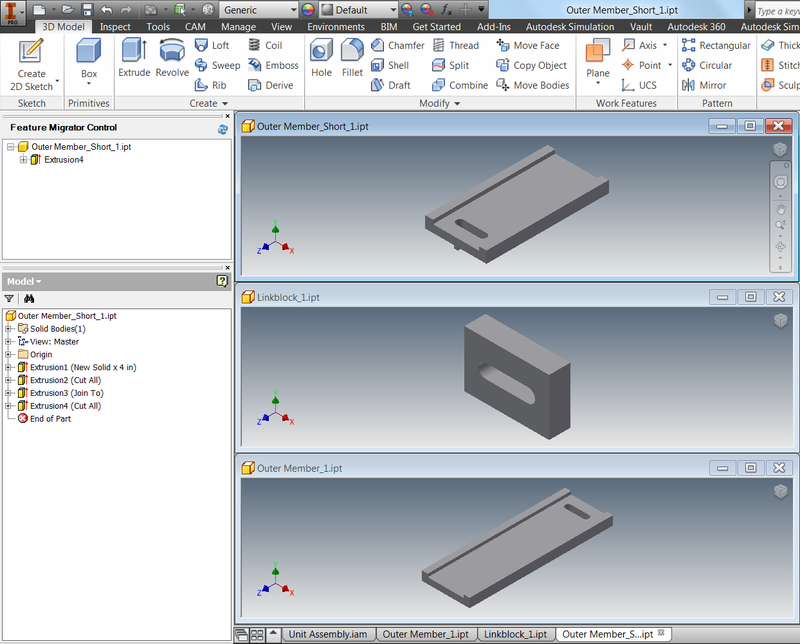 Sure, I could go into the Assembly Bill of Materials and see how many instances of the component I see, and while that works great, it doesn't always give me what I need. One way of checking how many components there are in an assembly. So what's a quick alternative? I'm going to right click on one of the components I'm curious about, and choose Selection>Select All Occurrences. Just like I've done with the shock assembly pictured here. 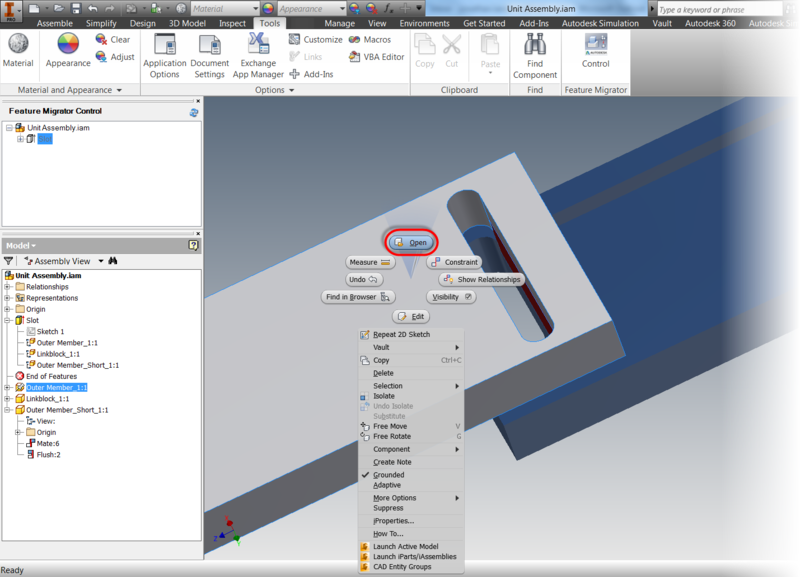 Right clicking and choosing "Select All Occurrences"
This will select all copies of of the same component on screen. 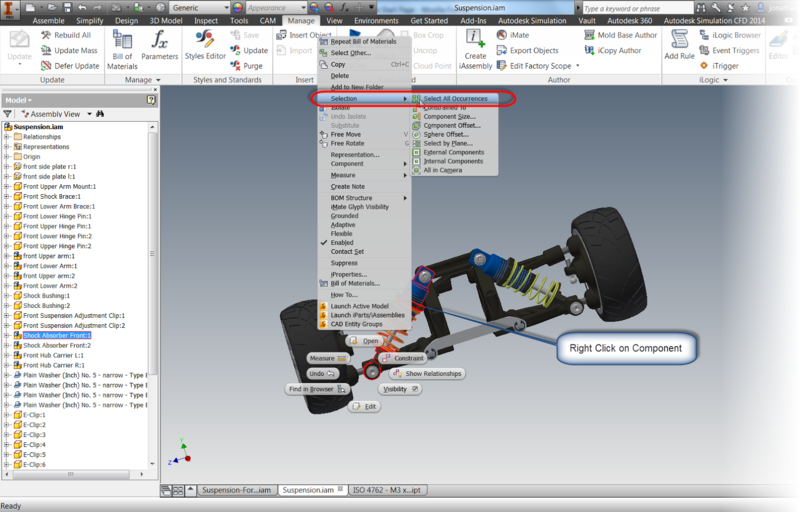 This quickly tells me how many components are similar visually, without leaving the modeling window. Now I can see that both shocks are actually the same assembly used twice, instead of two very similar, but different assemblies. As an added bonus, I can now change visibility, delete, and replace the components, among other commands, because I've already selected the components I need. To be fair, I'm not saying this isn't a replacement for other methods, like using the Bill or Materials to check how many components are in an assembly, but what it can do is check to see if "this component is the same as that component", when a quick check is needed. So give this a try and add it to your bag of tricks. When I was working with that assembly today, it was a big help! U2 - "I Still Haven't Found What I'm Looking For"
Sometimes, there really is "one magic" setting that can obtain the desired result. 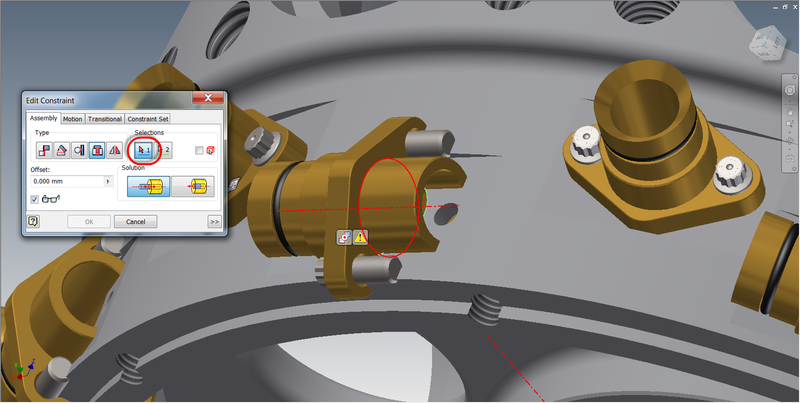 In Autodesk Showcase, I've found that one of these is setting the clipping plane. 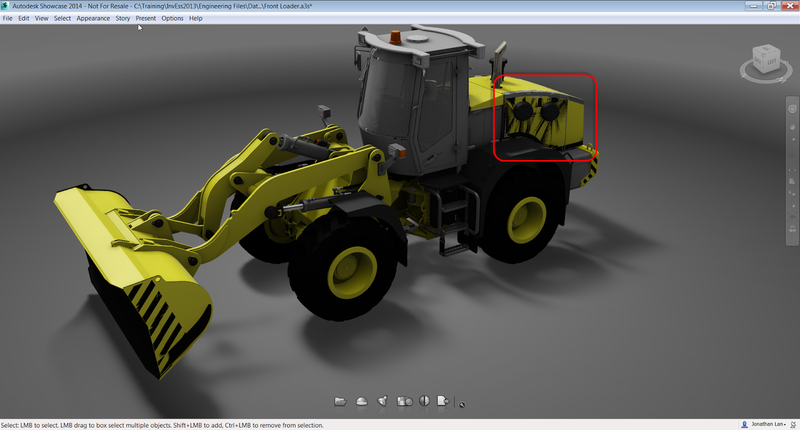 Sometimes, when a model is imported into a Showcase scene, black triangular streaks will appear across the model. What are those? They're not supposed to be there! They shouldn't be there, they're not right, and they're ugly. They're actually caused by Showcase not being able to sort the faces. The back face is actually bleeding through the face in front of it. Fortunately, they can be easily cleaned up with just one setting. The setting to change is highlighted. 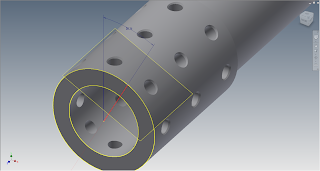 By increasing the number, the distance to the clipping is changed and the faces can set the correct order. In this case, increasing the setting to 2.000cm makes everything as it should be. 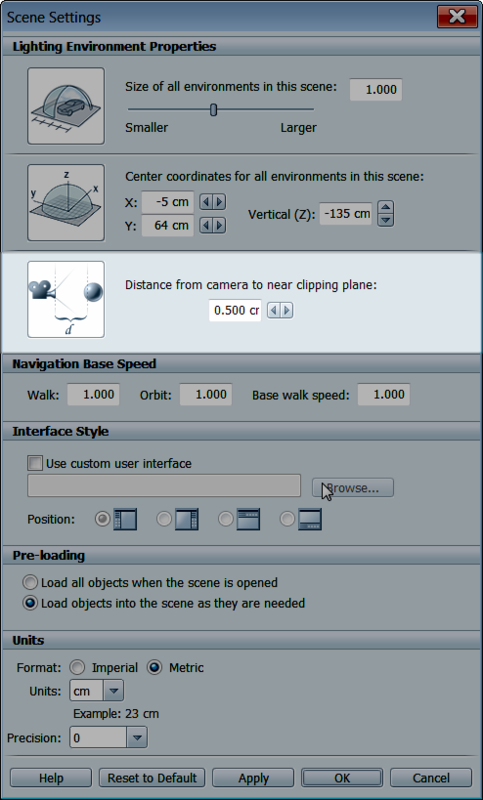 Of course different scenes may require different settings, so if you if you're working with your own scenes, you may have to try a couple of different numbers. But just that setting alone, can make a huge difference in how a Showcase scene appears in the end. For a fantastic explanation of this, take a look at the video below created by Marion Landry. She's the person who originally taught me this great trick, and she's definitely got the definitive video in my opinion!